Here's the thing: Kidd's sprinting speed was really good (above average), but that wouldn't mean anything if he couldn't dribble. He had excellent handles and was one of the most dangerous guys in the open court and even beat faster PGs up the court because of his excellent handles and high drive. Doesn't matter if you can run fast if you can't keep the dribble alive while you do it. Even the threat of his fast break changed the defense and it made him dangerous, even when he couldn't hit the three and just like Doncic, teams didn't just have to predict where he was going, but also where his teammates were because he was just as adept at the pass. Kidd's lateral quickness (side to side) was BELOW average at the combine, which should have been a red flag for his defense and yet basketball is so much more about intelligence, teamwork, prediction, and quick mental decision making-- all of which Kidd is superb at. We all know Kidd was perhaps the best defensive guard in the league and is up there with Gary Payton as best defensive PG ever. Maybe his raw athleticism wasn't there, but they aren't a great measure of the total player. Kidd was not a below average defender like his measurements may have implied. He was one of the best of all time. Kidd also had excellent height (6'4") for his position and good strength. Now back to Doncic, which is what the whole thread is (supposedly) about. Doncic has good height and decent strength. He also has those immeasurable underlying skills that Kidd had. The fact that Kidd didn't have the entire physical package makes me optimistic about Doncic's ability to be successful on both ends of the court. Very nicely put and exactly how I see it. I think the Mavs FO feels that Doncic is a pure natural basketball player like Kidd and that is why they moved up to get him. The guy probably slept with a basketball most of his childhood and seems to have a passion for the game much like Kidd and Dirk. The point has been in the Doncic comparison to Kidd is that he has many of the attributes as Kidd in terms of skills, talent, BBIQ, BB savvy competitiveness, assertiveness, leadership, charisma and overall love for the game. I don't think athleticism is a big part of his game like many other former and current stars lack as well. Last edited by rimrocker; 08-20-2018 at 06:38 PM. Last edited by Luka's Mom; 08-26-2018 at 01:43 PM. Good stuff on athleticism. Here's why it might be a bit overblown. How 'athletic' was Steve Nash? Or is Steven Curry? They all strike me as players who are maybe MORE 'athletic' with a basketball than without. Went to a small college for undergrad. Played some football there. They had some of the drill times of the basketball players posted in the locker room. One of the PG's ran lines faster dribbling than he did without the ball. Strange...but some people are like that. 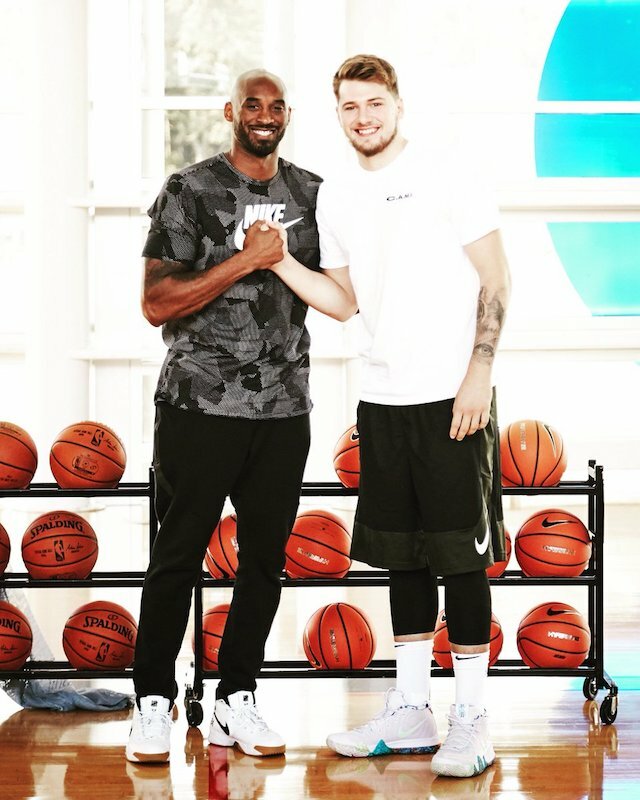 Kobe is 6'6", which makes Luka appear to be a full 6'8" or so in this pic. Sure, his hair makes him look taller, but he's also leaning in... Definitely taller than his listed 6'7". Last edited by Underdog; 08-30-2018 at 02:48 PM. Starting center... who needs DAJ? Last edited by sefant77; 08-30-2018 at 04:34 PM. Was his height ever in question? He was measured at 6’8” in Europe where they measure the players without shoes (unlike in the US). Dirk has said he’s a legit 6’8” too. Where is the kidd had avg athletecism coming from? Young kidd was one of the most athletic pgs in league history before rose/Westbrook/dsj. Am I the only one that watched young kidd???? As others said, it's the lateral quickness thing. That's what is being talked about with Luka too. Kidd could run in a straight line really fast, was really strong, and had great hands. Luka looks a lot like Kidd to me. Here he is playing defense the same way Kidd did. Lots of effort (the biggest part of defense) and high BBIQ. Good video. I'll take the guy with average athleticism but a lot of effort and IQ, over a guy who has all the physical tools, but doesn't have a clue how to play basketball nor has any desire to become great. Obviously it would be great if Luka had elite athletic tools too, but then he'd pretty much be a perfect prospect, like LeBron... And if that were the case, he wouldn't have been available for the Mavs. Last edited by Luka's Mom; 09-02-2018 at 05:46 AM. Luka is already preparing for next season! Loookin good! Last edited by gregsa; 09-02-2018 at 04:00 PM. Hey, if all of the players and coaches are drooling at the mouth, then it's definitely easier to joint he hype train. The big key seems to be the fact that he doesn't get jittery under pressure. If he can carry the weight of the hype and be himself we will be a much improved team. Why should he get jittery under pressure in some NBA regular season game with the typical cupcake atmosphere when he had no problems with the pressure and atmosphere in some crazy euroleague games. Last edited by sefant77; 09-14-2018 at 10:34 AM. Yeah, I see no reason why Doncic would get "jittery" in the NBA -- the kid has 3 years of professional experience under his belt, having already won under the most pressure he could possibly face in EuroLeague. He's ready for this. Last edited by Underdog; 09-14-2018 at 11:22 AM. Well it's still foreign to him and No league out there is as elite as the NBA. This is the place to be and the biggest stage, with the best players, and with the most critics. It's not far fetched to me that even Euro MVP could have jitters. Last edited by SMC0007; 09-14-2018 at 11:38 AM. Last edited by sefant77; 09-14-2018 at 12:38 PM. These videos really mostly don't do the experience justice - thousands of people shouting in unison around you just triggers some instincts. One of the really positive things about Luka fully understanding and being outstanding already in the PnR is that he can anticipate cuts and movement off ball defensively. I think he will be fine at SF vs most guys because they won't be able to kill him in ISO. It will be interesting to see his matchup vs GS for example, i can see him taking some time chasing Thompson around off the ball instead of trying to stay in front of Durant. He has trouble staying in front of pg's and really quick slashers, as do most players his size aside from Lebron and a cpl others. Teams will no doubt try to screen and pnr to get him in an iso vs a quick guard. Last edited by SMC0007; 09-18-2018 at 01:29 PM. Impressive stuff. Thanks for sharing. Cant wait to see Luka after a year or two in an NBA conditioning regimen. Cant wait to see him period! This would be the one concern everyone has about Doncic. To be fair... DSJ could do this to 90% of the league. But yeah he's going to struggle against the explosive/fast small guard. Edit- forgot to mention the workout after the practice footage. Pretty good stuff, never seen someone practice dribble/strength on grass going up a hill heh. Last edited by Bryan_Wilson; 09-19-2018 at 04:25 PM. That's why he is going to be guarding small forwards and PFs. Doubt he'll ever be on a guard unless forced to because of switches. Oh for sure. Even in the practice footage, he's only on him because of a switch. He uses his body really well on defense though. He is a physical defender which will work will on bigger guys. But yeah, he'll get blown by which is just something the team has to live with. Not fake news but it's not new news. Him getting beat off the dribble by small quick is nothing we shouldn't have been expecting. That's like saying we should judge the defense of players based on their defense at the allstar game. Defense is basically played at the same level. Plus Smith can beat anyone in the league one-on-one. A 6'9" white guy with zero NBA experience and no team defense doesnt' stand a chance. The video isn't meant to pass judgment when there is literally hours worth of actual game footage in Europe where he struggles, at times, with lateral defense with players much less explosive than DSJ. It was simply new footage and more of a microcosm of the one real concern that is pretty universal of his one perceived weakness. Thanks to a certain someone's daily countdowns I have been searching several times a day for stuff to give me a mavs fix. And DSJ beating my bae Doncic effortlessly was what I happened to find today. I have more of a concern with Doncic guarding PFs than I do with him guarding PGs. With a plethora of PGs on this team he'll rarely be in situations that will require him to guard guys 6'3" and under. Carlisle will go small before he will ever go big so Doncic guarding PFs is something that could occur frequently. Most likely he'll primarily be guarding the lesser (in terms of offense) wing imo. Last edited by rimrocker; 09-19-2018 at 11:49 PM. Dennis looks amazing here. As far as Luka goes, all nba point guards can do this to each other. This could easily be JJ with Dennis guarding. I honestly just write this off as 'whatever' against Luka. I see this as a nice move by DSJ and love seeing the work he is putting in during the off season. So far everything we've seen of him confirms that he is going to be very, very, very special. This looks like a kid that is not content to be very good in the NBA. He's got a goal to dominate and that gets me excited for the Mavericks future. 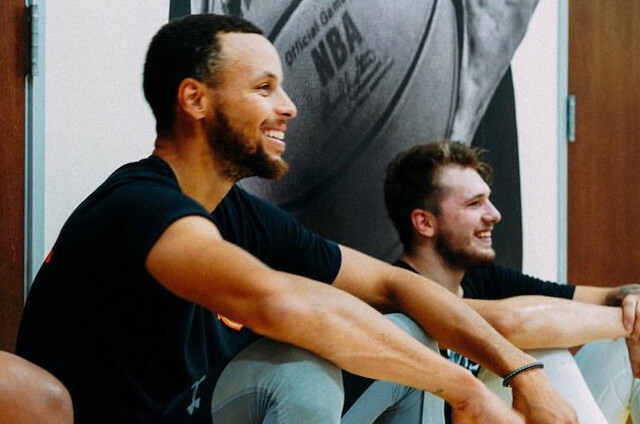 Also a pretty big thing: Looks like DSJ and Luka having a lot of fun together. No ego or drama who is the new poster boy etc. Smith said he has been enjoying playing with Doncic in scrimmages before training camp. “Me and Luk have been playing pickup, and every day we’re on the same team we get the most wins regardless of who is in there,” Smith said. Last edited by Underdog; 09-21-2018 at 11:37 AM. Hi! First time poster, Luka's fan! I've seen this today, anyone knows what's this about? Is this normal for an NBA practice?